Have you heard…. this year is going to be one of the worst years for ticks! When people told me this, I knew this was true when the first two ticks I saw in 2017 were in February! Typically, we never see ticks in the North East until at least April because the cold weather and snow keeps them away. Now, that it’s almost May, I’ve seen several more and each time it reminds me that I have to do everything I can to keep ticks out of my yard. Not only does this make it safer for me to walk around my yard without picking any up, but it also prevents my pets from bringing ticks in the house. I do spray myself and my pets with natural repellents, which really helps, but I’m still scared to do much outside because I know they’re lurking in the grass. 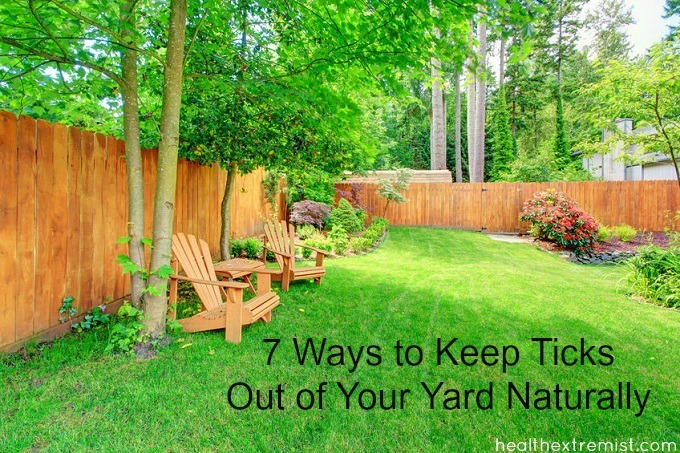 When I started researching and experimenting with ways to keep ticks out your yard naturally, I was surprised to find that many of them really do work! Ticks are real concern for us in the North East because we have such a high rate of Lyme disease. I have many friends that have Lyme disease, some with serious life-long health problems due to it. So, wouldn’t it be nice to be able to keep ticks out of your yard naturally so you don’t have to worry about picking any up? Well, there are many things you can do to reduce the amount of ticks in your yard and keep them away! Many are predicting that it’s going to be a very bad year for ticks and Lyme disease. According to a biologist at Bard College, the risk for Lyme disease is going to be very high this spring. This is partially due to the mild winter we had as this helped many of the ticks survive. In the North East, half the ticks you find carry Lyme disease, which can transmit to you when they bite your skin. Not only, can you get Lyme disease, but they can also transmit many other diseases as well. There are quite a few ways to prevent getting ticks on you and your pets naturally. In addition to using the strategies listed below for ways to keep ticks out your yard naturally, you will also want to include these in your regimen, as well, to prevent getting ticks. 1) Use a natural tick repellent on yourself- I spray this homemade tick repellent on my clothes, shoes, and skin before going outside. If you’re not into making your own, here’s a great naturally based repellent you can buy. 2) Use a natural tick repellent on your pets- I use this homemade spray with essential oils. It’s been very effective for my dog who likes to roll around in the grass outside. Here’s a natural one you can purchase if you’re not into making your own. 3) Wear light colored clothing so you can spot them easier and always check yourself and your children, and pets each time you come inside. 4) Take your clothes off when you come inside and immediately put them in the drier on the highest heat setting. Ticks won’t drown in the washer and will survive the cycle. But, they will die after just 5 minutes of being in the drier on a high heat setting. I’d leave the clothes in for a full 15 minutes though, just to be safe. 1. Use Plants that Repel Ticks Naturally– There are certain plants you can plant in the ground around your yard that will naturally repel ticks. These include: Lavender plants, garlic plants, lemongrass, chrysanthemums (specifically the pyrethrum variety), sage, rosemary, catnip and beautyberry. You can plant them around your property borders and around the most used areas in your yard such as near a pool, patio or swing set to keep ticks away from areas you spend the most time at. 2. Get Chickens – This is one I’m testing out this year myself! Chickens naturally eat ticks in your yard among many other bugs and insects. They are great for pest control! I’ve talked with many people that have backyard chickens and let them free range around their yard and they say that they hardly ever see ticks any more. 3. Get Guinea Fowl (type of bird similar to chickens) – Several studies have shown that having guinea fowl significantly reduces the tick population. They eat pretty much any kind of bug/insect they see. According to the University of Connecticut, guineas are effectively used to reduce the deer tick population. Many people get them purely for tick and insect control. This may just be the most effective of all the ways to keep ticks out of your yard naturally, according to research, but you have to be willing to take care of them as new pets, which takes some work. 4. Mow the Grass Very Short and Frequently– Ticks like to hide in long grass, so keeping it short will get rid of their favorite place. 5. Use Cedar Chips– Cedar naturally repels ticks and many other insects too. Put down cedar mulch or cedar wood chips around areas you want to keep ticks away. I put a wide border (about 2-3 feet wide) of cedar all around a small fenced in area I let my dog out to. This creates a safe zone inside the border of cedar wood chips and ticks don’t like to travel across it. So it keeps them out pretty well! If you have a wooded area in your yard, you can make a perimeter border with cedar chips or mulch to separate the wooded area from grass. This will keep the ticks from migrating in to areas you don’t want them to. 6. Get as Much Sunlight as Possible– Ticks love to hide in shaded and moist areas. That’s why there always seems to be an abundance out when it’s a cloudy wet day. Trim or remove brush, trees, shrubs and any other landscaping that creates shaded areas. Also, clear areas of leaf piles, sticks and cut grass. In areas you want to be tick free, try to get as much sunlight to them as possible to keep the ticks away. 7. Use a Natural Perimeter Poison to Ticks – This is one I’ve heard of with great results, but haven’t tried it myself yet. Food Grade- Diatomaceous Earth is very effective for killing ticks. Most often pet owners apply it to their pet’s fur to eliminate ticks. But you can also use it in your yard and on your decks/patio. Food-grade diatomaceous earth is a fine white powder that consists of fossilized phytoplankton and about 85% silica. It’s non-toxic and many people eat it to get health benefits such as increased collagen, and strengthening nails and bones. To use it to keep ticks out of your yard naturally, either use it dry or make a spray combining it with water. To use it dry, you can dust it in outdoor carpets such as on your deck to keep ticks away. To use it in grass or other areas, mix about 10 teaspoons of food grade diatomaceous earth in a gallon of water and spray the mixture over any areas you wish to eliminate ticks. I’m going to spray the mixture around my back deck to prevent any ticks from coming on the deck. I’ve heard of some people spraying it all over their yard to eliminate ticks from their yard. Hope this helps you get rid of ticks! Diatomaceous earth is not nearly as effective when mixed with water. 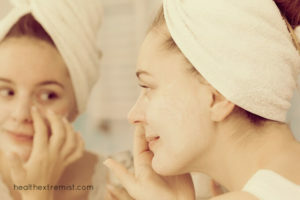 It is best dusted in dry form and it must be reapplied after a heavy rain. I got Lyme disease, as well as Babesiosis last year and it was not fun. Thankfully, all symptoms are gone. Anyways, the key for me is not rubbing against things, like bushes, shrubs, tree branches, etc.. Grass is easier – put your pants on the inside of your socks. Ticks don’t fly – they attach themselves to you, so anyway you can limit contact with what I listed above, reduces your risk of attracting a tick. One other thing I’m doing is to set traps around the yard to kill mice, who are prolific spreaders of ticks/lyme as well as other diseases. So sorry to hear that. Glad your symptoms are gone now. How are the traps working? I’ve heard of using them too. I don’t want ticks to get in my yard. We have had them before, and it was a massive pain to get rid of them. I’ll make sure to get some tick repellent to use on my family and our dog, for sure. Yes, they are too scary with all the diseases they carry. Thank you so much for this advice. We have acres of wooded land, with at least an acre that is landscaped. This means lots of wildlife for the ticks to hitchhike onto our cleared property where my grandson and dogs play. They drop off the wildlife and find there way onto us. We have found quite a few on us and in our home. My dogs have had Lyme and I am so scared that one of us will contract it. I don’t know how I am going to be able to manage such a large area. We just do the best we can with trying to keep the ticks away. It makes it hard with pets because they can so easily bring them in. I found one walking on my couch last summer. Your article should mention the dangers of breathing in the diatomaceous earth. Very dangerous to the lungs! When I had gotten my chickens I did have ticks and about two weeks after having them and letting run all over. I had no more ticks my yard was bug free. Best way by far. Using DM is a great way to kill insects, but the problem is that it will kill all insects. It is not a very good solution for a yard wide application. It is best kept to local applications like to pets and carpet to eliminate not only ticks but fleas. You have to be careful when applying it outdoors because it will also kill the bugs you want like bees, wasps, and butterflies and other beneficial insects. I once had a REAL bad flea infestation from when my stepdaughter brought her cat to my house. The poor thing was overwhelmed with fleas (it eventually died from it as we couldn’t kill them fast enough to save the poor kitten). We tried sprays and bombs…pretty much everything short of calling an exterminator. Then I ran across an article on Dm and bought 2 lbs of it…I think that cost me like 15 dollars and 10 years later I still have most of it LOL. We used it like carpet fresh on the carpets and the furniture, let it stay for several days (you have to keep it there for 2 complete lifecycles so it kills the adults and the hatching eggs before they can lay new ones.. We dusted our cats every couple of days until we were sure all of the ticks were gone and dead. This stuff is very effective. DM is made from crushed diatoms, which are microscopic organisms that resemble the spikey balls on medieval maces. What happens is the spikey parts will wedge themselves into the chitinous exoskeleton of insects and cause them to dehydrate…so when you apply this, you also want to try an eliminate as many water sources as possible. Since this is a mechanical action, they cannot build an immunity to it like they can with poisons. DM is also completely non-toxic and can be put in food to kill off internal parasites. Horse owners do this for their horses. So you also dont have to worry if your cat or dog licks it off. Again, you do have to be judicious with it. It will kill ALL insects…even the ones that you dont want to kill, so be very judicious when you use DM outdoors. Also…Opossums are voracious tick eaters, so this would be the exception to the rule of keeping wildlife out…you want to encourage them. Opossums are disease resistant, so they do not get rabies. They do love to eat ticks… Chickens, in particular, guinea fowl also like to eat ticks, so if you can have livestock in your yard (check municipal regulations in regards to this first), these guys are great for keeping the tick population down. Hears a trick I saw on TV ,a biologist had to see how many ticks and mosquitoes were on a area .The solution was take a 5 gallon bucket and put dry ice in it and put fly paper attached around it the carbon dioxide that is released attracts them from 30 yards away it doesn’t last long but will trap them . Going to try that! Thanks !!! I have used granulated sulphur to keep ticks & chiggers out of my rural yard for several years. Pets roll in the grass & it gets on their fur keeping them tick free too. You get it at farm supply stores & spread it with a seed spreader. Apply it about once a month or so, depending on the amount of rain you get, & you will be tick free all summer. Wow, that’s great! Thank you for sharing. I am always looking for more ways to keep ticks out of my yard. It doesn’t damage the grass?